Normally, I start State of the Program with a recap of the week’s news, but not this week. This week we have a preview card. The news will come later. Here is our preview card. Enjoy. This seems pretty sweet. It’s a 3/2 for three mana, which is eminently playable. It is a green human, so it will fit in GW Humans, GW Tokens or Bant Humans. Its ability will turn a bunch of 0/1 plants or 1/1 Thopters into 3/2 beaters. 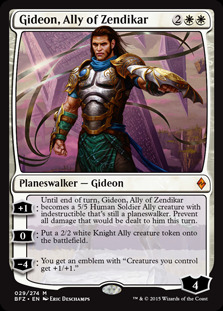 It can even “upgrade” Gideon’s soldiers, if you consider making human soldiers into horrors an “upgrade.” However, if those plants and soldiers have +1/+1 counters they lose the counters since the creatures are sacrificed and replaced, not transformed. I’m not sure that a one shot conversion to a 3/2 is better than adding counters, but you only get to play four Nissa, Voice of Zendikars. This could easily be the fifth and sixth card that can upgrade your weenies. Emrakul’s Evangel has one big advantage over Nissa – you can find it with Collected Company. Popping this in on the end of turn means it will be active on your turn. And, as I mentioned, it is a human so you may want to find room for a couple in Bant humans. Once again, it may not be as good as Thalia’s Lieutenant in upgrading your other humans, but it could be Lt. five and six. 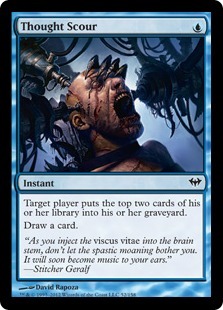 I could even see some use for this in decks like RG Ramp. 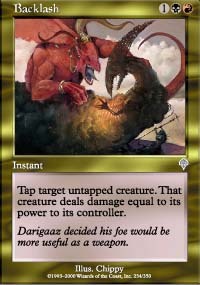 How cool would it be to attack with Chandra’s 3/1s, and then convert them into horrors after the damage is done? Maybe that’s too cutesy or just a wins-more, but it might be worth looking at, especially if Eldritch Moon brings us a token producer like Mogg War Marshal or Sengir Autocrat. 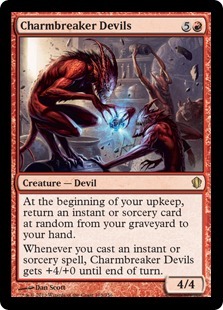 Also note that the Evangel combos well with Threaten effects – gain control of their creature, bash with it, then turn it into your 3/2 instead of giving it back. Yes, it is one shot, since the Evangel sacrifices itself, but sometimes that is all you need. In limited, this will clearly affect how games are played. When this is active, you can make alpha strikes into congested boards with confidence. Note that the Evangel’s ability costs zero mana, so you will have all your mana available for combat tricks. That means your opponent will have a lot of very difficult blocking decisions to make. Let’s assume you are playing a GW draft deck and are attacking with four 2/2s, a 3/3 and a 4/4. Your opponent has a couple 3/3s, a 4/4 and a 0/5. That opponent already has to worry about cards like Silverstrike, Tenacity, Survive the Night and so forth. But if you have Emrakul’s Evangel in play, s/he also has to worry that, if s/he just blocks the three 2/2s with creatures that could kill them, and blocks the 4/4 with the 0/5, even if you have nothing in hand, you can just turn everything that would die into untapped 3/2s. And s/he takes five, as well. If you are on the defensive, this card is equally good. If they alpha strike, you can chump block with Emrakul’s Evangel and all your weenies, then convert all the blockers that would die into live 3/2s ready to attack next turn. You can also feed creatures afflicted with Pacifism or the like to the Evangel. Now you are sacrificing creatures, including the Evangel, so this is not altogether a win, but Evangel certainly offers opportunities. More importantly, it makes combat a lot more complex for your opponent. That’s great. The more complex it becomes, the more likely they are to make mistakes. In the end, the way to win Magic games is to make fewer mistakes than your opponent, so give them every chance to make a lot! I want to close with my dream scenario. It’s a Commander game. 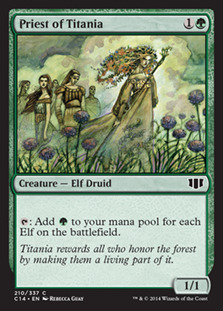 You have a few elves (including a Skyshroud Elf to turn green mana red), seven or eight lands (including Gaea’s Cradle) and a Lightning Greaves in play. Maybe we should also add a City of Solitude (players can cast spells and activate abilities only during their own turns), since this is about to get filthy and you don’t want to be interrupted. First you cast Nature’s Revolt. Now all lands – yours and theirs – are 2/2 creatures, and your Gaea's Cradle taps for at least 10 mana. Next, cast Insurrection. Assuming your opponents don’t all concede in response, you will gain control of all lands and creatures in play. Insurrection also untaps all those lands, including your Gaea’s Cradle, so you now have about 1.5 bazillion mana available. You could use some of that mana first, or attack, but I would simply cast Emrakul’s Evangel, stick the Greaves on him and activate his ability. His activated ability now reads: sacrifice this, ‘Geddon and Wrath all opponents, put a 3/2 in play for every land and creature they lost. I once managed the Nature’s Lore / Insurrection trick with a Goblin Bombardment in play. This would be better. Of course everyone will concede in response to the ability, but it will still be glorious. Eldritch Moon Spoilers have Started: Duh – there’s a spoiler in the previous section, and lots more around the web. The EM card image gallery is here. Vintage Cube Returns July 13th: The powered Cube is returning in a couple weeks. Wizards has not changed much, but has tweaked things a bit. They are correcting colors for some cards (e.g. Dismember will be considered colorless going forward). 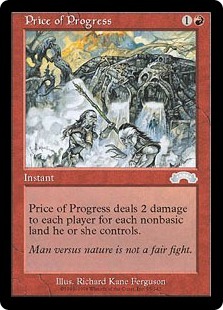 The big news is that the entire cycle of modern man lands will be in the Cube. Read about it here. This is a list of things we have been promised, or we just want to see coming back. Another good source for dates and times is the MTGO calendar and the weekly blog, while the best source for known bugs is the Known Issues List. For quick reference, here are some major upcoming events. In addition, there are either one or two online PTQs each weekend, with qualifiers running the three days prior to the PTQ. · Power Nine Challenge: Last Saturday of the month, at 11am Pacific. Next one July 30th. · Legacy Challenge: Second Saturday of the month, at 11am Pacific. Next one July 9th. · Eternal Masters: June 16 through July 6. Details here. · Vintage Cube: July 13 to July 27. Info here. · Eldritch Moon Prerelease: July 29-August 1. Details here. · Kaladesh Prerelease: October 7-10, on sale October 10th. Product code KLD. · From the Vault Lore: releases online October 10, 2016. Flashback drafts are 10Tix / 100 Play Points / 2 Tix plus product, not Phantom, single elim and pay out in play points: 200 for first, 100 for second, 50 for third and fourth. Flashback This Week: The next Flashback draft is double Shards of Alara plus Conflux. The Shards money cards include (Ajani Vengeant), (Elspeth, Knight-Errant), and (Knight of the White Orchid). The Conflux money card is Noble Hierarch – that’s it. My opinion is that our preview card is cool. I wrote about this, and got snarky about Brexit. That’s enough for this week. The article is really long already. I have been training new judges for many years, and part of that training involves setting out scenarios and problems that teach various parts of the rules. They start simple – i.e. a creature with trample is blocked by a creature with protection – and get harder as they go. The goal is to determine what areas of the rules I need to teach, and what my candidate already knows. And to have some fun. Here we go. Those of you who remember last week’s question may have a bit of an advantage. (You can read last week’s article here.) This week, it is the start of your turn. You untap. Upkeep triggers go on the stack. You have plenty of mana, but no cards in your graveyard. You have a Lightning Bolt in hand. You have two Charmbreaker Devils in play. The problem is that I am at 38 life (you are at 15), and this is turn five of extra turns. You have to win this turn. I have no blockers, and only one card in hand. Can you win this turn, or are we going to draw? Standard: Two Standard GPs last weekend. GW Tokens and Bant Humans were everywhere. Dromoka’s Command was ubiquitous 58 copies across the two Top 8s, out of a possible 64. That’s nuts. Whatever – Standard will change shortly. But for now: coverage of GP Pittsburg is here. Coverage of GP Taipei is here. Modern: No Modern GPs this week, but SCG ran an open. Top 32 decklists are here. The variety of archetypes on that list is impressive. Pauper: I generally leave the Pauper metagame to the Pauper specialists that write for this site, but I did see a sweet deck I like. Legacy: No big Legacy events this week. Not even a lot of 5-0s in the competitive Legacy leagues. But we have at least one interesting decklist. Vintage: The VSL Season 5 is ongoing. More importantly, the most recent Power 9 Challenge was last weekend. Decklists are here. Standard staples: Standard was down, almost across the board, again this week. Prices are down everywhere. I’d guess this is a mix of people getting bored with the formats, coupled with the need to raise TIX for Eternal Masters drafts. Modern staples: Modern is mixed this week. Cavern of Souls just keeps climbing. Legacy and Vintage: Legacy and Vintage are mixed this week. Eternal Masters cards are fluctuating. Daze has finally dropped low enough to fall off the table. Rishadan Port, on the other hand, is headed for the stratosphere. Set Redemption: You can redeem complete sets on MTGO. You need to purchase a redemption voucher from the store for $25. During the next downtime, Wizards removes a complete set from your account and sends you the same set in paper. The following is a list of all the non-promo, non-foil cards on MTGO that retail for more than $25 per card. These are the big ticket items in the world of MTGO. 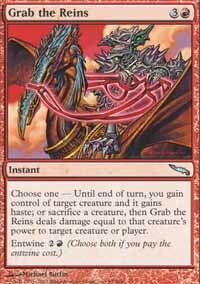 Rishadan Port is up again, and pushing $1k per playset. That’s insane. The list is just under 70 cards, with the original dual lands reappearing on the list, and the Power Nine moving up. The big number is the retail price of a playset (4 copies) of every card available on MTGO. Assuming you bought the least expensive versions available, the cost of owning a playset of every card on MTGO is $ 27,240. That’s down another $410 from last week’s number. Eternal Masters is having an effect, as is the end of the format. Rotation is approaching, so people are selling off Standard leftovers. I managed to wedge in some Magic this week. I played a flashback draft, and lost to Oona in the finals. I played some more Standard. No league bugs this week, but this time I lost the mirror. 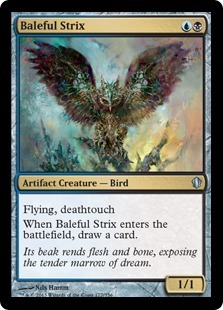 I’m still playing Bant Humans, so facing the mirror is not surprising. I have not played any Eternal Masters, yet, but I have watched a couple videos, and I am getting the bug. I better get on it fast – EM drafts end pretty soon. HammyBot Super Sale: HammyBot was set up to sell off Erik Friborg’s collection, with all proceeds going to his wife and son. So far, HammyBot has raised over $8,000, but there are a lot of cards left in the collection. Those cards are being sold at MTGOTrader’s Buy Price. It is the start of your turn. You untap. Upkeep triggers are about to go on the stack. You have plenty of mana, but no cards in your graveyard. You have a Lightning Bolt in hand. You have two Charmbreaker Devils in play. The problem is that I am at 36 life (you are at 15), and this is turn five of extra turns. You have to win this turn. I have no blockers, and only one card in hand. Can you win this turn, or are we going to draw? Note that Charmbreaker Devil’s does not target. This means that the return-a-card abilities will go on the stack, even if there is nothing in the graveyard. This means that you can stack the two triggers, then cast Lightning Bolt targeting me. This will trigger the +4/+0 ability for both devils; then the bolt will deal 3 damage to me. (Devils are 8/4s, I’m at 35 life.) 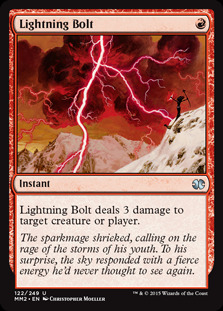 Then you let the first return a card ability resolve, which will return of the Lightning Bolt (only card in graveyard) to your hand. Cast it targeting me again, triggering both devils and bringing me to 32 life. Let the final return trigger resolve, returning the Bolt to hand. Then cast the Lightning Bolt one final time. Once it resolves, I will be at 29, and the Devils will both be 16/4s. You can now attack for the win – or could, except that I have a card in hand. During playtesting, Grab the Reins was called Bring and Fling. I liked that name. And an entwined Grab the Reins would indeed kill you. However, in my judge testing box, I have a copy of Backlash and that would kill you. I particularly like Backlashing a Blightsteel Colossus or a heavily pumped Commander. Watching a player die to damage from his own general is good times. Technically a single Backlash wouldn't necessarily kill you--you don't have to cast the third Bolt until after you're attacking. It does mean you'll draw though. Pretty sure this is in reference only to cube for sorting purposes. I expect there is some internal algorithm that randomizes for each color a certain number of cards to be drafted in a particular pack and dismember now counts as a colorless card for that purpose because it is often played for 1+4 life, rather than 1 + BB, or 1 + B + 2 life. Nicol Bolas, Planeswalker and Knight of the Reliquary are worth more than K. of the White Orchid. My floor is usually the price of a pack - money cards have to be worth more than $4. Knight was last week, and I just copied the money cards from then for Shards. NH is the only card worth over $4 in Conflux. Knight of the White Orchid is also in Shards of Alara, which is why it was listed with Shards, and Noble listed with Conflux. Hows it going with the judge lawsuit, any updates ?